It’s no secret that I’ve never been a fan of the Ninja blenders. 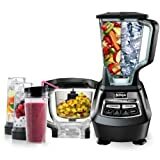 But the latest Ninja Mega Kitchen System 1500 has a more powerful 2hp motor, its a great ice crusher blender and combines many of your other kitchen utensils in one. Turns ice into snow in seconds. Juices whole fruits and vegetables. Makes 2lb dough in 30 seconds. Superb even chopping every time. It’s never factored amongst the best blenders here at BlenderExpert.com… I’ve always felt like it was a ‘Jack of all trades and a master of none’… And quite frankly, up to now the Ninja blenders have performed like they are jack of all trades and masters of none. Those annoying Ninja infomercials online have actually been physically painful to watch over the years, they all seem so ‘over the top’. I mean let’s be honest here, even the name ‘Ninja Blender’ is kind of annoying and those little Ninja characters actually wind me up! “I’ll rip it apart and explain once again why it doesn’t match up to the Vitamix or the Blendtec, then all will be right in the world once more”! Yes, in my heart of hearts I knew that it was never going to work like it does in the infomercial. So guess what? It’s time for me to blend a little humble pie… The Ninja Mega Kitchen System is a very good appliance. They beefed up the motor to a 2 Peak horsepower and it now spins the unique Ninja blade system at around 24,000 rpm (that’s almost as fast as the Vitamix blender). This extra power really has made an enormous difference to the performance of this blender. For those who are not yet familiar with the way a Ninja blender works here’s a quick rundown. Most conventional blenders work with a single blade at the base of the jug that blends anything it comes into contact with, but does nothing to drag down the thicker unblended stuff from the top. So unless you take off the lid and manually push it down it won’t be blended thoroughly. To eliminate this problem the Ninja blender incorporates a cylindrical tube which runs from the bottom to the top of the jug. Along the length of this tube are six freely spun razor-sharp blades. This stops air pockets, allowing the blade to spin freely. The blades are razor sharp, so be careful when handling them! Ok, so now we know how it works let’s take a look at what you get in the box, what it does and how well it works. 1 Extra Large BPA-Free 72 oz pitcher for blending and juicing. 1 x BPA-Free 64 oz (8 cup) bowl, blade attachment for processing/dough mixing. 2 x BPA-Free 16 oz single-serve blending cups, with integral blades and lids to go. The Professional Prep Package, which includes several discs and slicers to be used in food processing (currently $59). The smaller 3-cup bowl upgrade, which comes with an additional cookbook and 2 extra single serve cups (currently $79). You can purchase these upgrades separately or together for around $119. Powerful 1500 watt, 2 horsepower motor. Stainless steel six blade system in the pitcher, four blade system on processor. 3 Speeds, single serve, pulse and ? Jar material is BPA-Free SAN plastic. Dishwasher safe pitcher, bowl, cups and blade set. Ninja say that the Mega Kitchen System blends and juices whole fruits and vegetables into wholesome tasty drinks giving you 100% of the nutritious pulp. Yes, the blender does blend whole fruits and vegetables and produces tasty nutritious drinks. However… Juice lovers beware, it will not produce a smooth pulp or seed free juice unless you pour it through a sieve. Ninja says that it can turn ice into snow in seconds to produce frozen cocktails, slushie, smoothies, shakes, frappes and ice cream. The ice to snow is actually pretty “cool” and it works quite well. My only complaint here would be that any smoothie made with hard fruit can be very pulpy and perhaps the ice cream isn’t that great, not as good as with the Blendtec or Vitamix (the latter could be that I’m not very good at it with this blender yet). Ninja say that the dough mixer can be used for both wet and dry ingredients and has the power to produce cookie, bread and pizza dough along with batters, deserts and many other baking needs. I say yes it can, wow! 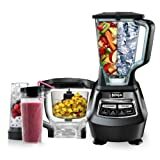 The processor did handle most items really well, at least as well as what you would expect from most decent food processors and would defiantly say it is a welcome add-on to a blender. The price point is great! Considering all of the tasks the Ninja Mega Kitchen System can do, I have to say that I think the price is extremely good value. It comes with a good family size pitcher and bowl, a real plus point. The Single serve cups are especially handy for knocking up a quick health drink for one; they create less washing up and fit into the cup holder in my car nicely. Boasting 1500 watts 2hp, this petty much speaks for its self! The dough mixer and food processor really can’t be faulted, they handled everything I tried in them and did a great job. Lots of extra time-saving attachments also available to purchase at reasonable prices (some of which I haven’t yet tested so I don’t like to comment on them). The pitcher, the bowls and the single serve cups are plastic and don’t seem very durable. I’ve already managed to scratch them a couple of times when removing the blades, having said that the Ninja blades are extremely sharp. I wasn’t over impressed with the Juicing performance, although still tasty and drinkable it was pretty grainy. The Ninja blender is big and isn’t going to fit under most people’s kitchen counters and obviously because it comes with various attachments you’ll need to make room for them to. Some of the smoothies I made with hard fruits and vegetables where a bit pulpy, once again they tasted good but let’s just say you couldn’t drink them though a straw! The Ninja Mega Kitchen System is a fairly new model and to date has only received 21 ratings on Amazon. However, the early signs are pretty good, as 14 of them gave it five stars producing an overall 4.5 rating. But sorry, as an out and out blender, it’s still not on the same level as the Blentec or Vitamix, it simply doesn’t blend as well, it’s good, but not quite as smooth. It also doesn’t seem as durable. If I strip away the Dough mixer and processor which I think I should, after all this is a ‘blender review’. Both the Blentec and the Vitamix do everything that this Ninja blender can do and they do it better, with smoother results. Having said that Vitamix/Blendtec is probably an unfair comparison. The Ninja Mega Kitchen System has a lot to offer and is definitely better than the majority of household blenders at the same price. 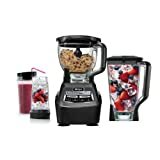 If it was on the same level as the Blentec blender or the Vitamix blender you would probably be paying around $500 rather than the $170 price tag it comes with! 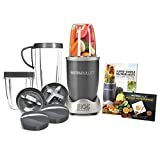 Not everyone can justify or even afford to spend the $500 on a high performance blender, and I for one will be very happy to have the Ninja Mega Kitchen System 1500 in my home… This one’s a keeper!